I tried to make December simple by doing all the Christmas shopping beforehand, but it turned out that it wasn’t simple at all! This year, Christmas was on the weekend so school went right up to Friday beforehand – and I was scheduled to fly out to Korea for a work trip that week. I would return back home the day before Christmas Eve, but miss out on the last week where we have to hand out gifts to teachers & etc. That meant that I had one less week to prepare everything and had to make sure all the gifts were organized, and cards written (by the kids, which takes a lot longer). Next, the weather was really cold (-10 every morning + wind chill) so it was a pain to actually get the kids to school (at least they weren’t allowed to play outside). 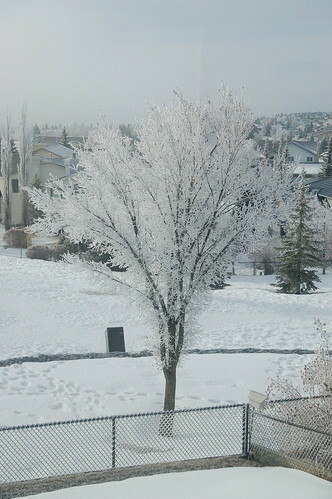 There was also one week which started with a winter storm (10cm) that dropped on a Sunday night. The main roads were clear for rush hour, but not the side streets. Then on the Thursday of that week, there was a surprise blizzard (how does the weather forecast miss this stuff) that dropped another 10cm right before evening rush hour (at least I was able to pick up the kids). Finally there was supposed to be another 10cm on the weekend, but that only ended up being about 2cm. In any case that was a lot of snow to shovel and guarantees a White Christmas. The week after that, a stomach virus started making the rounds. First Jovian got it, then 5 days later (long incubation! ), I got it. Apollo followed a day after me, and then Pauline got it 2-3 days after him. That almost overlapped with Christmas! Both Jovian and Apollo stayed home or had to picked up earlier a couple of times which made the scheduling hectic. At least through all this, my Korea trip got cancelled/postponed, so I was able to take care of the kids. When the holidays hit, it started getting warmer. We did our usual dinners and family stuff. It was actually pretty light because I took the week between Xmas and New Years off and there weren’t THAT many dinners, so we did a lot of cleaning up around the house. Did some minor Boxing Day shopping (online) and then welcomed in the new year at home. I ended up doing a lot of travelling to the US this month. I made a trip to California at the beginning of the month for a couple of days, then a day trip to New York a week later, and at the end of the month we went to Pennsylvannia/Buffalo for Black Friday shopping. It feels like I’m in a constant cycle of packing and unpacking now even though I don’t really travel for work. I started working on a new app idea this month after my last app got pulled from the store by Google. I have a good idea for the product, but I don’t know if I want to do all the technical work to make it releasable. Maybe I will just release a prototype/technical preview to the store to see if it catches on. Between Black Friday and buying online, I think we’re actually done all our Christmas shopping this year! That means the next month is just for relaxing right? Well we’ll see. December this year felt really busy. In the past, we would be busy with Christmas preparations, but with every year, we improve our workflow and are able to properly sequence Christmas shopping (and get it done in time). So that’s not a big problem (anymore)! This month was hectic for me because of this. It was stressful, required research as well as preparation, and I had to think through various scenarios which I had no experience in. That took a lot of time and effort, and I had to relegate a bunch of hobbies to the back burner (e.g., I made no progress on my next Android game). It also delayed our vacation planning; so after my job situation was settled, we had to plan our trip out properly. Then Christmas happened, and then Boxing Day/Week. On the days between Christmas and our vacation, there is an illusion of calm (besides, neither of us had to work), but there is actually a mad rush between catching up with friends/family and shopping. For Boxing Day, we had nothing we really needed to buy, but headed downtown to Yorkville/Eaton Centre to see if there were any good deals. There were lots of people, but not many things that we bought. With all of this happening, we somehow managed to go skating each week in the month, which is some fine dedication and surprising! Another surprising thing is that I’ve taken to using Twitter more – mainly to update my Facebook status (this is why); but also because it can mirror my status onto my Lifeblog properly. This December (and Winter) has also been odd in that it hardly snowed. The first snowfall (and corresponding learn-to-drive-commute) usually happens in later November, but it didn’t snow in November. It didn’t snow in December either! We had a green Christmas, although Mother Nature made a last ditch effort to drop some flurries down on Christmas Day, but there was no accumulation. The temperatures were fairly mild too, but it finally started getting cold when the season actually changed. I hope it ends up being a light winter, instead of a delayed one. It’s only December, but believe it or not, we have already been skating three times this winter! Well the first time we went, it wasn’t winter yet, but it was indoors at the ACC so there was ice. We went again last weekend, to a nearby arena . The arena was already packed with kids, seems like we are a bit snow in starting to skate this year! Finally, this weekend, we tried an outdoor skating trail in Etobicoke. We’ve gone to another skating trail in the past, up in Richmond Hill and that was pretty cool. It is different skating outdoors on a trail, because the ground is not inherently flat (although they try to make it flat, but it’s more difficult than a rink). You sometimes have to do a bit of work because the trail goes slightly uphill, or you might start going downhill (a bit). The one in Samuel Smith Ice Trail in Etobicoke. It seems more flat, and a bit longer than the one at Richmond Green. There’s also a little bridge that you have to go over, which is kind of dangerous because if you fall approaching the bridge, you either hit the concrete railing on the bridge, or if you are lucky and miss that, then you plunge into the river! I’m in Calgary over the Family day long weekend, surprisingly, visiting family. For once I am using a holiday like it is supposed to be used! Unlike Toronto, it is quite like winter over here; there has been snow on the ground for a long time, but luckily there hasn’t been a storm while I’ve been here. I’ve seen this before in Waterloo, but usually the trees melt before noon. Not so much here, and it stays around for the entire day. Makes the neighborhoods look like they walked out of a Christmas scene! February started off with the groundhog seeing his shadow and predicting six more weeks of winter. Did you know that the groundhog is only correct 39% of the time? Well he certainly seemed to live up to the trend because immediately afterwards, we had a week of above 0Â°C temperatures. The groundhog’s prediction was vindicated near the end of the month however, as we’re mired in -15Â°C weather again. The Oscars and Grammys were also cold, at least to me. I still have no idea who won what at the Grammys and I didn’t watch any of the movies that won Oscars. The most entertaining news out of the Grammys was Chris Brown’s assault of Rihanna though. Other black people having a bad month was Obama, as he had to visit Canada during winter and actually try and get things done with his new government. The various stimulus bills have ended his honeymoon period and now we can actually see if he can bring changeÂ® to the USA. I started listening to the radio again this month, but it’s not really a pleasant experience. In terms of gaming, I spent this month playing Burnout Paradise, and Rez; with a smattering of Rock Band here and there. I caught up a bit more on my Japan blogging, and moved my blog onto WordPress. The big change this month is really in terms of my blogging. I’m trying to play nice with the blog ecosystem and evolving my blogging so the content is better. This winter has been a good skating winter. I always say that I want to go skating, but in the end I don’t go that much. Sometimes I don’t go for the entire winter, but this year I’ve gone three times so far, for the lighting of City Hall, at the Richmond Green skating trail last week, and at Harbourfront on Saturday. When I heard about the skating trail at Richmond Green, I was intrigued because I envisioned a walking trail winding through the park that had been covered with ice. In reality, it was a little like that, but also a bit not. It was a trail with ice over it, bordered by rocks and trees; but it was also wide and not really a long circuit. It was kind of like a big fat boomerang shaped rink with rocks and trees. A little more interesting than the normal oval outdoor rink, but not worth the drive to Acton Elgin Mills. Hannah organized a skate yesterday at Harbourfront which was fun. I think I have skated enough this winter to not get tired or achy the day after, although I’m still not getting any better. My gas mileage has been getting progressively worse this winter, and thanks to Fuelly I’ve been getting depressed because of it. I have only low gas prices to prevent me from slitting my fuel lines. I’ve bottomed out at 8.3L/100km one time! I was curious why my gas mileage had decreased so much in the winter months since it wasn’t a car maintenance issue. I did some experiments and I’m pretty positive that turning on the heater (I usually just leave it in the middle or slightly to the heat side) decreases my gas mileage by almost 0.5 L/100km! I didn’t use my heater or ventilation (where possible) and my gas mileage is back in the high 7s again! Now I just have to figure out why it’s not in the high 6s. Back In The Day, I Drove Uphill. Both Ways! I took a snow day yesterday, which in addition to my (semi-)snow day last week meant that I probably shouldn’t work at home today again (I had to do a presentation today anyways). So I woke up this morning and started my trek to work. Since it had snowed the entire night, the plows and salters had not had a chance to plow my route yet so the roads were covered in (packed) snow. It felt like I was driving in the prairies or in Colorado, except i didn’t have snow tires, studs, or chains. The tricky thing about these scenarios are the hills, and seeing as how I had to cross (and climb) the Don Valley to get to work, it was very tricky indeed. I don’t really have alternates that bypass hill climbing. If I take Yonge, I have to climb north of Steeles. If I take Bayview, I have to climb north of Finch. If I take Leslie or Steeles, I have to climb around that intersection. So I took my normal route, Finch which has two hills. One between Leslie and Bayview and another approaching Don Mills. I didn’t realize or think about this much until I approached the first hill where traffic started to back up. At this point, a lot of cars did a U-turn (because conveniently the other lane was blocked further ahead by cars stalled while climbing hills) but I trudged on since I had no viable alternate. I mosied along up the hill, which is actually the gentler of the two, and at the same time witnessed a big oil tanker in the other lane leave plenty of buffer in order to build up momentum, but that was all of naught as he eventually stalled and blocked the road. I made it up to the top without issue but at which point I was forced to stop at a red light and then got stalled. After trying the usual tricks, I eventually got going again after a minute and made my way towards the next hill. The Don Mills hill is even steeper and I’ve seen cars getting stuck in the truck lane on previous days. However, there was less of a traffic jam so it was smooth sailing. Even the top was partially cleared of snow! Surprisingly, there was one last challenge before the 404. There was one traffic light on the crest of a small hill which had for some reason accumulated a lot of snow (and some leftover cardboard traction by other cars), but I was able to pace and get by without stopping. The 404 was surprisingly clear of all snow, and in retrospect I should have just taken the 401 to 404. Markham was also plowed, and that seems to be a pattern. Toronto needs to get its plowing solution together. On Saturday, we met up with Dave, Peter and Sophia for some Wintercity activities. Wintercity is Toronto’s winter festival answer to Ottawa’s Winterlude and the Quebec Winter Festival, although most of the events are overshadowed (at least on this blog) by Winterlicious. 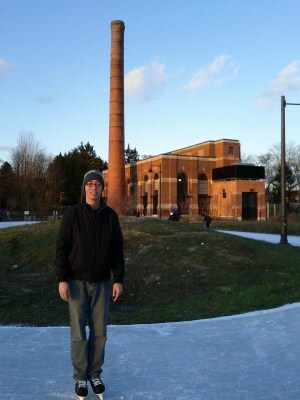 You may remember my previous Wintercity-related blogs in which I talked about Toronto Water. This year, there were fewer concerts (although I kind of wanted to go to Tokyo Police Club after the Truffles dinner but more interesting events. We saw an hour-long performance of Alice in Wonderland on stilts, which aside from a remarkably cold -1°C, was neat. The idea of using stilts was a very clever idea, because instead of being on a stage, the performance was physically within the crowd. There were crowd ushers clearing away people so the actors and vehicles could move around , and character entrances were from every corner. It made it seem like a very interactive experience. Although it would have been more interactive were we able to understand the story (and it didn’t help that they spoke in French and Italian ((and German?)) at various times). We saw the 5PM show, which meant the sun was setting and I didn’t have great light (although it was a cloudy day to begin with). Afterwards, we headed indoors to heat up a bit before heading outside to watch the lighting of Nights of Fire put on by France’s Cie Carabosse. This was another dead simple idea that was brilliant. It consisted of clay pots arranged on metal stands (think stands for flower pots) and then lit on fire. There weren’t any acrobatics, or art; it was just fire in pots! We were lucky to be on location when the event started and saw them lighting the displays, which I guess is better than showing up later and watching fire in pots. Although, standing around watching fire in pots is at least warmer than standing around. Afterwards, we went for another Winterlicious dinner which I’ll blog about later. I wanted to book a decent place (which is why I spent Thursday calling around); but being unsuccessful, figured we would just decide on something the day of. Then I remembered, that we went to Bb33 for Winterlicious last year, and it was pretty empty (and close!) so we ended up going there for dinner. Today was the first day that I voluntarily took advantage of our mobility program and worked at home. I say “voluntarily” because I also worked at home on Christmas Eve, but I think everyone works at home that day normally. The reason I worked at home today was because I didn’t want to spend my time sitting through the rush hour crawl, although it would provide me time to listen to some CDs I’m auditioning. But as it turns out, I ended up driving to work eventually because I had an important presentation to attend. It was a web/tele conference so I could have presented at home, but I ended up going in because there were other Toronto folks involved. Ironically, the other Toronto person that was on location ended up calling in from their desk because the conference room I booked was too far away. The drive itself wasn’t too bad, it took me 45 minutes to get there — about twice the normal non-traffic rate. I dreaded the drive back because the roads weren’t entirely clear and it would be rush hour; but luckily everyone left early (or worked at home) so my trip back was pretty normal. I went skating on Saturday for the first time in three years. I like skating; there’s something about gliding along without exerting a lot of work that is serene and peaceful. And every year, I try to go; but due to people not being interested, never getting around to it, or just plain being lazy (skates are bulky to carry around) I haven’t gone for a few. The great thing is that muscles have photographic memory, so I still remember how to skate even after taking a several-year-long vacation from the ice. My muscles however, are like those seasonal workers that can’t find paying jobs in Newfoundland so they decide to move to Ontario and help sell consumer electronics to people who need to fill the foundations of their Christmas tree. Saturday was also one of those days where the City of Toronto celebrates its Cavalcade Of Lights. There were more lights this year (but I bet used less energy thanks to LED lights) and live music as always. We arrived around 7 just as Suzie McNeil started her performance. Her performance was pretty much the same as at Beach Fest; she did her singles, Bohemian Rhapsody, that song that she sold-out to Bell for (she tells the same story every time) and Silent Night. After skating awhile, we decided to go off to dinner because certain people didn’t have skates and didn’t want to wait in line to rent them. So we treked back to the Eaton Centre, Rishi bought a pair of skates, went to Pickle Barrel for dinner and then went back to Nathan Phillips for some more skating. By this time it was 11. We missed the fireworks, the skate rental place had closed, and they had turned all the lights off. The ice was still there though, so we put on our skates again and skated (and rested) some more. At the same time, we were sharing the rink with some pickup hockey players, who were clearing the accumulated snow off the ice. They were gradually encroaching on the leisure skate part so eventually we decided to just call it a night. Good timing too because the predicted winter storm was just about arriving. It’s ironic that I blogged about not blogging about work, because I have a slew of posts this week related to work. Today’s work blog is about curling. Random people from work booked a sheet of ice at the Richmond Hill Curling Club and we went up to try our hand at curling. It was a bit weird because it wasn’t a work-sponsored morale event, we just left in the middle of the day to curl for two hours, then came back to work. I had never curled before, but from what I heard it was not too bad. It seems like a laid back sport, not something you would do for exercise, but maybe to kill some time — like bowling. We had two people who had experience curling, so they taught us the ropes. I had a bit of difficulty navigating on the ice at first, which I blame on not having gone skating in awhile, but I got a lot better at it once I relearned my skating muscles. We also taped the bottom of our shoes so that we could slide around, so fun! We then spent some time throwing the rocks. This was tough. At first we just practiced sliding off, which took a bit of practice because it was hard to maintain balance. It was actually easier with a rock because you can put weight on it to stabilize yourself, although it’s not something that you should be doing. Eventually I realized that I could either not lose my balance, or aim where I wanted the rock to go. For the remaining time, we played 3.5 rounds. Our team, even though 75% of us were noobs, beat the other team that had slightly more experience than us by a score of 4-1. Yay for beginner’s luck. It was fun, although I found the game to be a bit slow as there’s a lot of sliding up and down the ice to talk strategy. It is a bit of a workout (although I stress “bit”) too. At times, I had to work hard to keep ahead of the thrown rock, and you can do some crazy sweeping as well. I think the game would be more fun if it was given a Virtua Tennis arcade style treatment though. Just think about your strategy and throw the rocks, hitting your plan 90% of the time. P.S. I brought my camera, but left it in the lounge area. Too bad we didn’t have subs so I could grab it and take some action shots. Oh well. You know what the say about March, “In like a lion, out like a lamb”. Well, here’s the lion. The drive home wasn’t too bad, I left an hour or an hour and a half early, and arrived home at my usual time. I made good progress on 7 since all the traffic was going the other way. I saw an interesting fellow who started brushing snow off of his dash, while driving, by reaching out of his window with his sweeper. So I guess I wasn’t too surprised when I later saw people out of their vehicles scraping ice off their windshield while waiting to turn left. After that though, it started to get weird. I passed eleven (11!) stalled VIVA buses and spent an hour going up and down 2 hills. The first hill didn’t have any problems, and I’m not sure what was the slow down; but it was stop and stop traffic so I tried to pass the time by reading a book. The second hill was pretty incredulous, it was a VIVA bus obstacle course. At first, there were 3 VIVAs stalled at the side of the road, then there was another VIVA which was alternatively stalled trying to get up the hill, or moving slowly in the left lane. So all the cars had to do an S to get around these obstacles. Finally, the pièce de résistance was at the top of the hill, where there was a spread of 4 VIVAs blocking all three lanes at the top of the hill! Suddenly it’s not so smart to have accordian buses. The rest of my trip was pretty tame, I came across two instances of abandoned vehicles in the left lane (?) and I couldn’t get in my driveway due to a snow drift. My memory is going!! I don’t remember the last time that I’ve gotten sick. Not like a stuffy nose that gets cleared up later in the day sick, but real honest-to-goodness throat infection or nose = waterfall type sick. I’m pretty sure that hasn’t happened in the last 3 years, maybe ever since I went to University. Let’s hope this blog doesn’t jinx it. So that’s pretty good, want to know my secret? Maybe sitting in front of a monitor kills germs through radiation, otherwise I have no idea what. I can tell you what it’s probably not though, it’s probably not home cooking/living at home, since I was living at university and in the US. It’s not from bundling up in the winter or getting a flu shot either. So yeah, I will stick with the glow from the monitor idea. Today being Groundhog Day, I came to ponder a dumb little question this morning. So everyone knows the story, if the groundhog sees its shadow, then it scoots back into its hole and there’s 6 more weeks of Winter. Looking at the calendar, the official start of Spring, March 20th or so, is 6-7 weeks away from Groundhog day, so the groundhog will always, technically, be correct with that choice. So what if, like today, he doesn’t see his shadow? How many more weeks of winter do we have? We’re supposed to get an early spring, so does that mean 2 more weeks of winter? 4 more weeks of winter would put us into March already. I don’t think the lore is quite thought out on this holiday. Also, instead of being afraid of his own shadow, wouldn’t the groundhog be afraid of all the flashing lights and paparazzi waiting outside as he stumbles out of his home? How does he know to come out on February 2nd anyways? Does someone buy him a calendar every year?